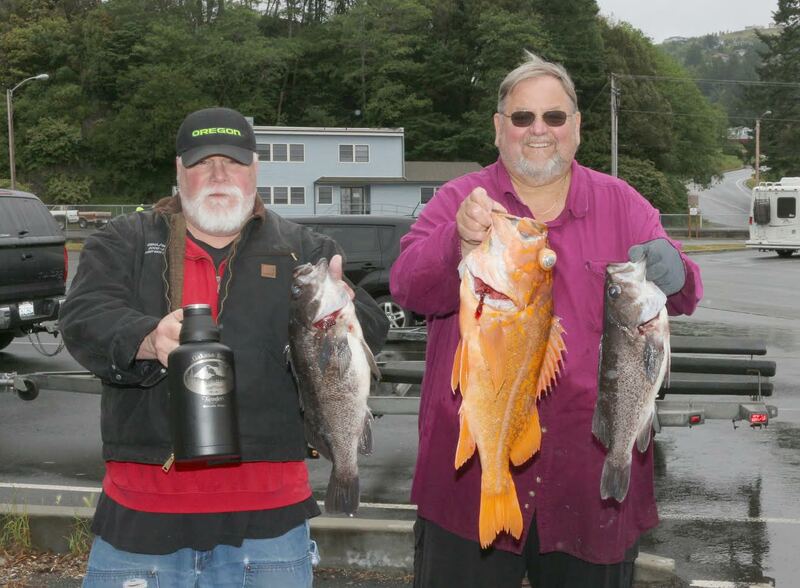 John Tymkowicz (left) of Estacada, Oregon got together with his former coworker Don Williams of Brookings, Oregon last week and scored royally on some large blacks and a huge goldfish which were caught out of the Port of Brookings Harbor. When I was a lad, I was always the last person to leave the lake, river or ocean because I wanted to squeeze in every fishing moment that I could. If truth be told, I am still that very same person. Which makes this coming Wednesday especially near and dear to my heart. It's my favorite day of the year because it's the first day of summer, which also happens to be the longest day of the year. Beginning to get the picture? But just for the sake of being scientific, this year, the first day of summer (also called the summer solstice) falls precisely on Tuesday, June 20 at 9:24 pm. Yep, the first official minute of summer this year actually falls at night. Which makes the two following days, Wednesday and Thursday the longest days of the year. On these days, there are officially 15 hours, 18 minutes of sunlight. Factor in that a person is allowed to angle for game fish one hour before sunrise and until one hour after sunset, and that gives an angler 120 extra bonus-point minutes, bringing 17 hours, 18 minutes of angling pleasure to Wednesday and Thursday fishermen as well. After Thursday, daylight hours start shrinking 1 minute every three days. But what's 1 irrelevant minute anyway? Well, since you asked, one minute of time allows a trout angler to make a minimum of 4 casts with a Panther Martin spinner or a Super Duper spoon. It also allows a salmon fisherman to make at least 2 casts with a one-ounce Krocodile or it just permits a baited rod to be locked and loaded in its holster for an additional 60 precious fishing seconds. Oh what a glorious day the first day of summer is to a fisherman! With the summer solstice rounding the bend, that will allow ocean, lake and river water to start warming up, with some red-hot fishing following suit. Anglers fishing on the lower Rogue River have also been catching more late springers and early-run fall Chinook this past week. "I had three hatchery Chinook in the boat yesterday," said Rogue River guide John Anderson on Thursday. So what does an adipose fin-clipped hatchery Chinook mean exactly for Rogue River aficionados? Well, the Rogue's fall run is a completely autonomous, self-sustaining strain of Chinook, so you won't find any fin-clipped fall kings on the Rogue, except for a very small portion of Chinook which return in October that are fin clipped by the Curry Anadromous Fishermen in Gold Beach. So if you catch a fin-clipped king this time of year, it's definitely a late-run springer. A salmon with its adipose fin intact could be either a springer or a fall king. The girthier they are - the springier they are! "The wet weather we had last week actually did give us an uptick in numbers of Chinook," said Jim Carey from the Rogue Outdoor Store in Gold Beach on Thursday. "We actually had some decent river fishing. We continued to have numbers through the week. We had fish yesterday and we had fish the other day, and all the fish seemed to be on the lower 5 miles of the river." And anglers are now starting to pick up the first Chinook in the estuary by trolling the Rogue bay. "I've actually heard of three fish taken out of the bay," noted Carey. "One was taken near Lex's Landing, one by Jot's and another by Indian Creek. And two of the fish that were caught out of the bay didn't have sea lice on them, so that means that they had to have already been in the river and maybe they moved upriver and then moved back down." So get out your spinnerbait/anchovy rigs and buy new hooks. The Rogue estuary looks like it's starting to come around. In addition to the salmon fishing, large redtail surfperch are still continuing to be caught in large numbers. When the weather has been decent, fishermen casting their favorite baits and lures out of the Port of Brookings Harbor are also enjoying some very good lingcod fishing and stellar rockfish fishing. Next week's article will focus on how to rig up for trolling the Rogue bay Chinook. Hint - start buying your homemade spinnerbait/anchovy rigs at Lex's Landing, Jot's Resort and the Rogue Outdoor Store.